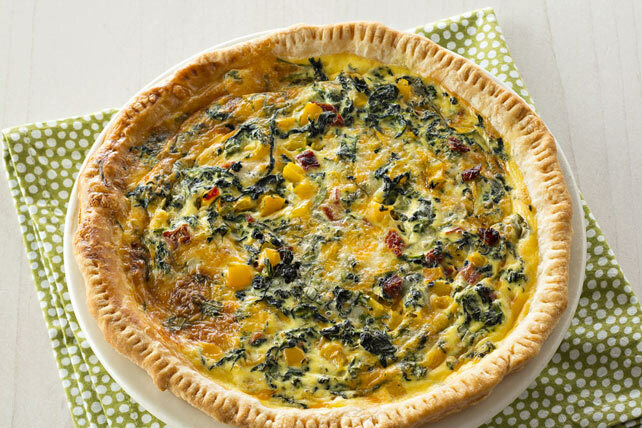 Here's a great quiche for the veggie lovers in your home—made with chopped spinach, peppers and sun-dried tomatoes. Heat oil in large skillet on medium-high heat. Add peppers; cook and stir 5 min. or until crisp-tender. Stir in spinach and tomatoes; cook 1 min. Spoon into crust; top with cheese and basil. Whisk remaining ingredients until blended; pour over ingredients in pie plate. Serve this quiche with fresh fruit to balance out the meal. Substitute a 9-inch square baking dish for the pie plate. To serve, cut quiche diagonally in half twice, then cut each triangle in half.